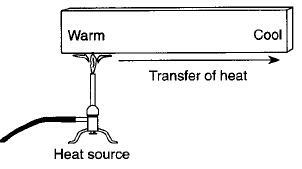 Conduction is how heat is transferred in solids. Particles near the source of heat gain more kinetic energy and vibrate more. They can pass this energy onto their neighbours. Metals consist of a lattice of molecules in a regular structure and a sea of free electrons. This cloud of electrons can move around very easily. These electrons can pass on their heat energy to each other. Insulators do not have free electrons and so the heat causes the lattice of molecules to vibrate. They pass on their energy to neighbouring molecules. A substance that transfers heat energy well is called a conductor and one that transfers it poorly is called an insulator. Metals are good conductors. Heat will always travel from hotter to colder. If you remember from the states of matter section, when particles gain more energy they vibrate more. If they are vibrating more they will move further apart. This will make the material expand. 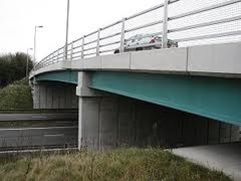 Why does this bridge have gaps in it?